If that’s a typeface, I’m impressed. It looks like it was hand-lettered, from a time when there were people who did that. Sort of like you are doing now. What a beautiful way to connect two aspects of your life. I’ve read this poem before, a long time ago. It was on a fan graphic of some sort that I now can’t find, and can’t remember what fandom it was… oh well. Anyway, this is beautiful! My favorite part is the lilies of the valley sprig at the top. I believe the piece came to Jarom’s great-great-grandmother after the sudden death of her husband, Maxwell Zaiss (a son of Christian Zaiss). 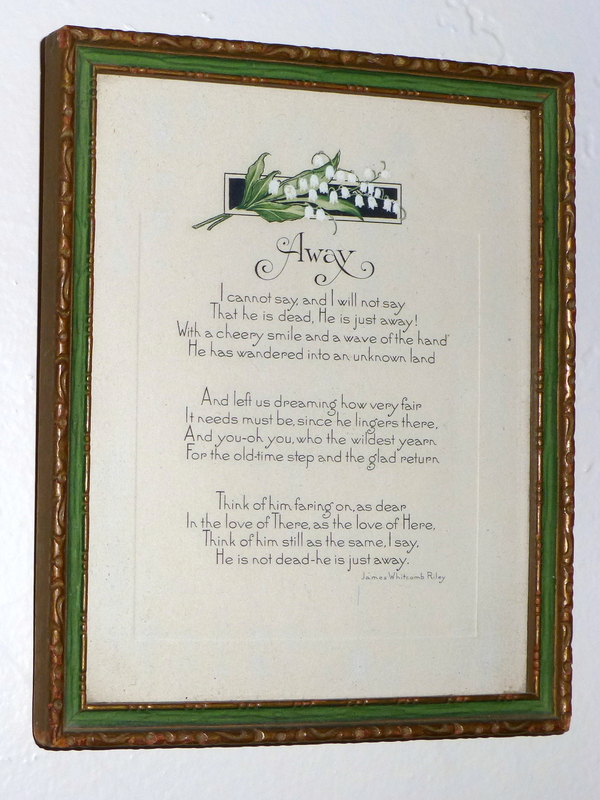 It was among the things kept by Jarom’s great grandmother, Mildred Zaiss Hillery.